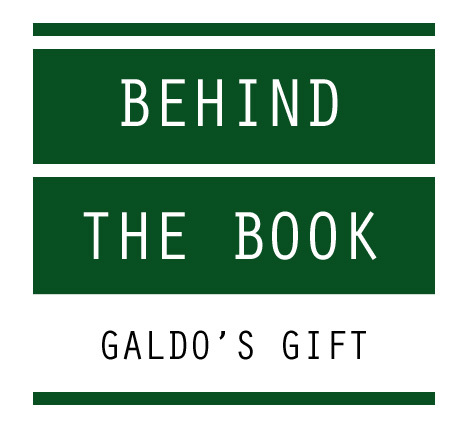 If you haven’t read Galdo’s Gift, the new Boovie (book in motion) by Tapocketa’s Trevor Young and Eleanor Long, you are in for a treat. Trevor previously worked on the Harry Potter series and The Hunger Games, while Eleanor has worked on TV Shows and Films, including The Borrowers. 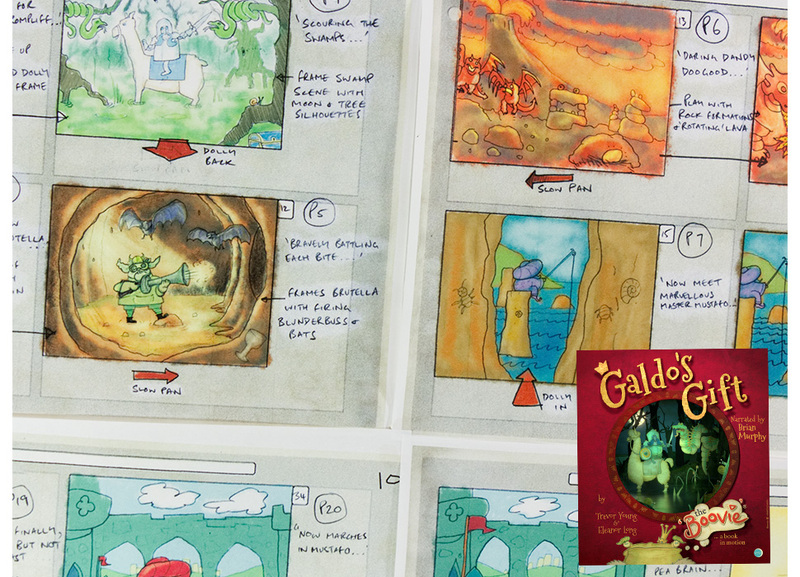 Galdo’s Gift brings literature to life for a digital generation. It’s personalised and takes you along on an adventure packed with helpful tools, like a pop-up definition when you tap a word, to help your child learn new terms. It also has fun hidden features, like beautiful butterflies flying out of treasure chests when you click on it. You have the option of having King Galdo himself narrate it to you (voiced by Brian Murphy) or read it yourself and enjoy the lovely musical score. We caught up with Trevor and Eleanor to chat about how their collaboration started, the inspiration and what’s next for Tapocketa Studio. Congratulations! I Love Galdo’s Gift. What Inspired You To Write This Book? Thank you very much! We really enjoyed writing, drawing and animating it. And we were inspired by so many things in relation to how it looks and moves as well as the story itself. But to begin with, we made a digital book because it would allow us to introduce movement and sound into a story which is very important to us. The ebook that we have made really does push the boundaries of what is possible within this medium and is quite unique and unlike other ebooks. So much so that we made up a new name for it! It’s a Boovie; a book in motion. It’s not a book, it’s not a movie; it’s a BooVie! We also wanted to use our imagination and skills to make a product that people would enjoy using and would lighten their day; inject a bit of fun and enjoyment into people’s lives. And a children’s book was a great place to start. We could see how we could develop our illustrations and animation with humour, care and creative thought. We really enjoy being inventive and finding new ways to achieve a goal. Our inspiration for the visuals comes from many sources; Monty Python, Oliver Postgate (Ivor the Engine and BagPuss) to name but a few of our early influences. Pollocks Victorian Theatre (the museum in London is well worth a visit), English Folk Art and also gadgets and old-fashioned machinery with knobs and dials and ratchets figured highly in our minds whilst drawing and making the illustrations, and designing the layout itself. Having worked in the prop and model-making industry for film as well as in computer special effects we are passionate about the paper element and handmade feel of the characters and set (scenery etc). We wanted them to look like paper and also move in a hand-operated way, so we came up with multiple techniques and processes to enable us to do this. The story started from the idea we had for a poem in a greetings card. The poem developed and just kept on going with more and more ideas and verses to add! We then realised that this could be a fantastic tale for a children’s story, although we do think that you don’t need to be a child to enjoy the story! You Have Been Involved In Films Such As Harry Potter And The Hunger Games, Stories About Adventures and Quests. Are These The Types Of Stories You Like To Explore? Trevor really enjoyed his time working on three of the Harry Potter films and The Hunger Games: Catching Fire amongst many others and I learnt several years after we met that we had both worked on The Borrowers, he worked on the visual effects and I in the prop making department. I’m sure this has informed the work that we currently do. The intrigue, suspense and discovery of an adventure plot is fun. And a quest of some sort always presents a great opportunity to introduce make-believe lands and fanciful characters. How Did Your Collaboration Start? We wanted to find a project that combined our collective skills and interests. We are both very artistic and enjoy creating and making artworks (we first met years ago on an art foundation course before going our separate ways to each pursue our own visual art specialisms). Fast forward (quite) a few years and we were both working hard for others and decided that we would join forces and make something together. So we got out of the rat race, set up on our own and created Galdo’s Gift on a shoestring. The aspects we get most excited about is making up the story and the drawing, making and animating the characters and scenery. The way we work is very flexible so we are able to investigate tangents or make up new elements if we think that this will add to the story and overall experience for the reader. We have happily found our own specialisms and work well together within that. We definitely pull in the same direction when it comes to design and artwork and through learning new techniques we have strengthened our skill set and ability to achieve our goals. 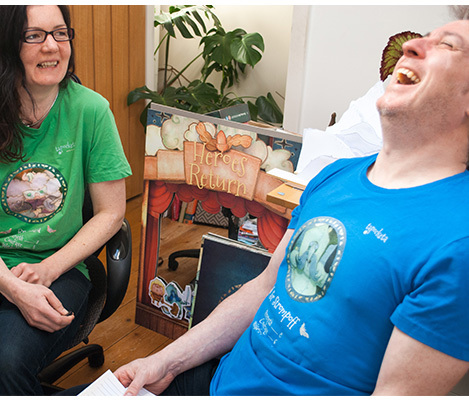 What Do You Hope Children Will Get Out Of Reading Galdo’s Gift? First and foremost we want children to enjoy Galdo’s Gift. You tend to learn most readily when something is fun and memorable in a humorous way. We love hearing a child quoting King Galdo showing an enjoyment of the language and sound and shape of the words. Brian Murphy’s narration as King Galdo is such a wonderfully rounded and comforting voice. The definitions are included to help a child understand what could be new words or just to strengthen their understanding of a phrase. So often in English, one word may have multiple meanings so we have tried to keep the definitions within the context of the story. 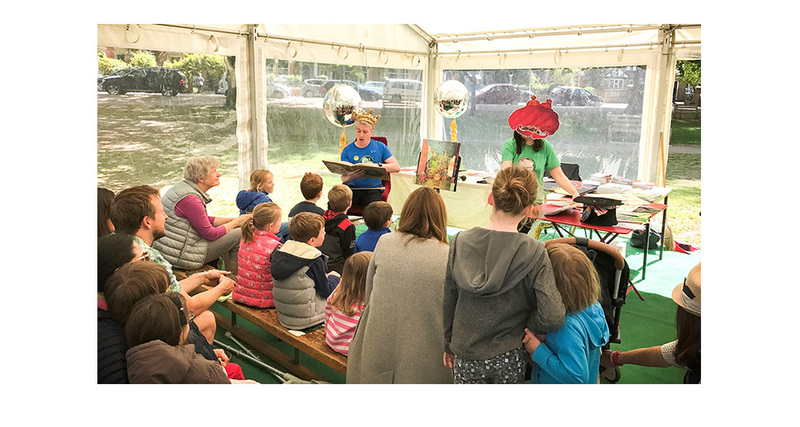 Also if a child can discover details in the animated illustrations that they weren’t expecting we hope that this could help to trigger a child to use their own imagination for their own stories and plays. First and foremost we want children to enjoy Galdo’s Gift. You tend to learn most readily when something is fun and memorable in a humorous way. The Characters Are So Lively. Do You Have A Favourite? We both have a soft spot for Brendara! She is such a fondly recognisable character. She reminds Trevor of his auntie, and me of a lady I used to work for! There Are Hidden Clues In The Book. Was That Always Something You Wanted To Add? 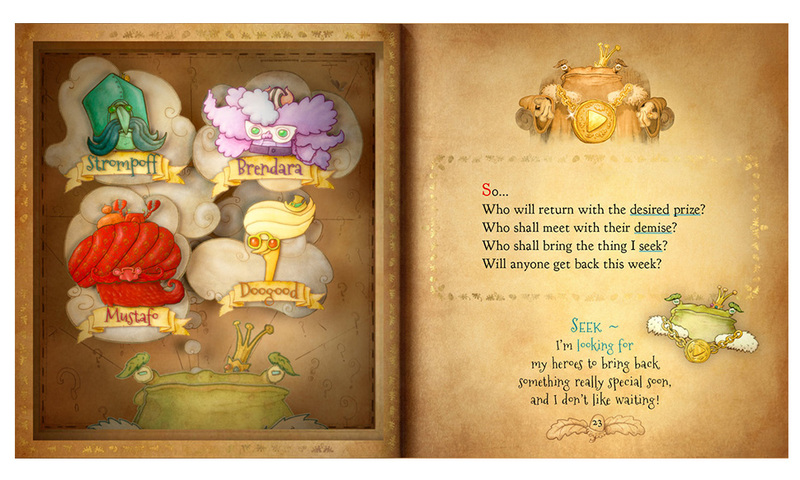 The idea of the hidden clues came from a friend’s son who, after enjoying the story, suggested that it would be good if there was something for him to do and be rewarded for at the back of the book! We then went away and dreamt up the clues and how to find them. So thank you, Frankie! It was also important to us for the moving illustrations to have a rich narrative in themselves so we included lots of visual detail and funny quirks. 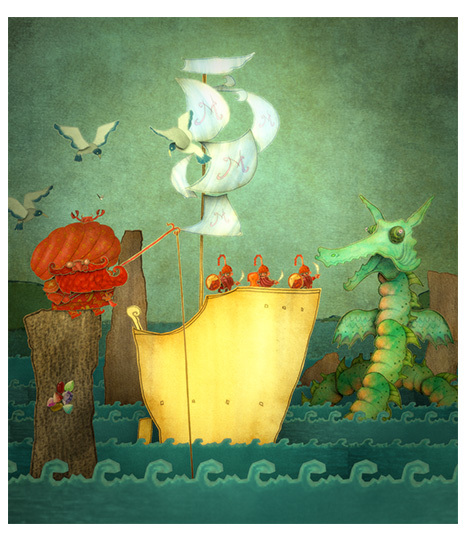 We wanted children to be able to look at any scene and find details that could inspire them to make up their own stories. There are also alternative gifts in each of the scenes out in Galdovia that are not mentioned in the verse at all. We thought that on repeat reading/viewing these may be noticed and spark a conversation with a parent, sibling or friend. What’s Next For Tapocketa Studio? And then, we have so many ideas going forward which use our creative, computer and practical skills. We do have a couple of projects in mind for development which is very exciting for us. Again these use animated pictures to illustrate stories. 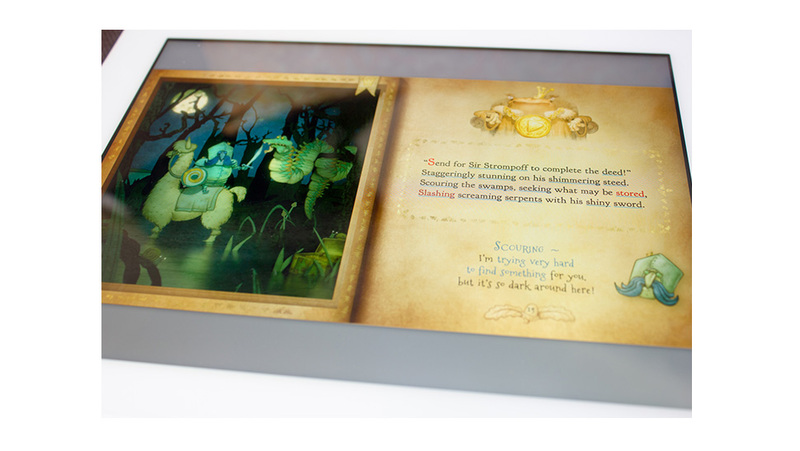 One of the projects involves our own fictional story and the other project will illustrate real-life escapades! We hope to develop our work and profile so people get to recognise and enjoy the love, fun, care and attention we lavish on projects for others to enjoy. We are also planning to collaborate with others on some of the new work so will keep you posted!